Fr. 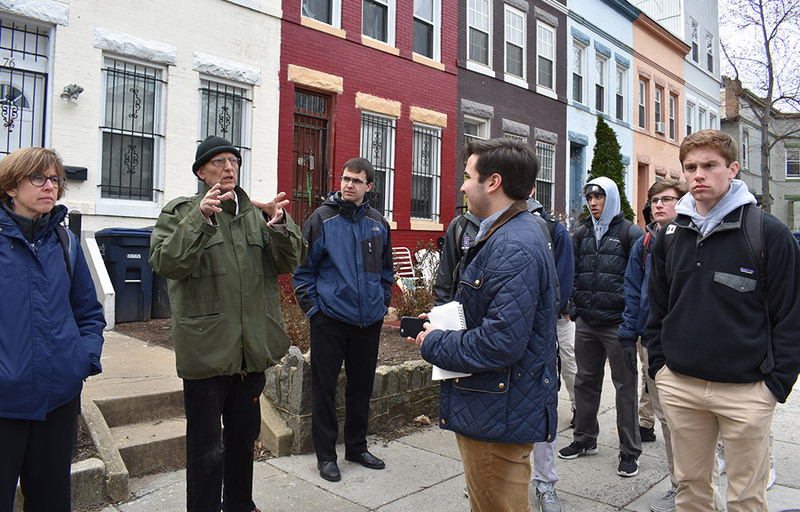 David Bava, Pastor of Holy Redeemer Church and member of the Board of Directors, leads a group of students from the Social Justice in Action class at Gonzaga in a walking tour of Ward 6. The Father McKenna Center is located on the campus of Gonzaga College High School, in the basement of St. Aloysius Church. Also on the campus is the Jesuit Community of St. Aloysius Gonzaga, the home for Jesuit priests and brothers serving in a variety of ministries across Washington. Our Jesuit connections and roots are vital to our mission, and we have visible geographic reminders of them every day. The Center is in a complex part of the city. Our Ward is rapidly gentrifying, and has significant concentrations of affordable housing. We have many long-term residents who are struggling to maintain a place in their historic community, and many newcomers who are eager to forge communities of their own. We are in the shadow of the US Capitol, where issues of homelessness and poverty are debated at a policy level, and steps from Union Station, where the complexities of homelessness and poverty are witnessed every day on a human level. Washington DC as whole is experiencing tremendous redevelopment. Economic disparities are widening, while people are being drawn to the city by perceptions of economic opportunity. DC is also challenged by the scourge of illicit drugs. Many of the men who turn to The Father McKenna Center for assistance in stabilizing their lives are returning citizens (recently released from incarceration), challenged by homelessness and lack of employment opportunities. Fr. Horace McKenna, SJ, walked the streets around the Center every day of his ministry. As we continue to serve the men and families of those streets, we seek to engage with compassion, dignity, and care. All of our programs are designed to see the individual neighbor, not just the challenges they are facing. We renew our connections with the paths Fr. McKenna walked each September, as our supporters Walk for McKenna.